Congratulations to 2014 Golden Halo Winner — Charles Wesley! The Lent Madness Supreme Executive Committee congratulates Charles Wesley on his victory in Lent Madness 2014 and authorizes the following text to be sung on Easter Day at liturgies throughout the world. Charles Wesley is risen today, Alleluia! his triumphant holy day, Alleluia! who the Golden Halo won, Alleluia! ‘gainst all saints, the battle done! Alleluia! unto Charles, with golden ring, Alleluia! who endured his brother John, Alleluia! all his hymns are sine qua non. Alleluia! But the bracket he endured, Alleluia! left his victory assured, Alleluia! now above the rest he’s king, Alleluia! where the saintly angels sing. Alleluia! Sing we to the S-E-C, Alleluia! praise their humor, praise their glee, Alleluia! praise Lent Madness, all you lot: Alleluia! Celeb Bloggers, Tim and Scott, Alleluia! ** Liturgical Note: As the wise and adept preacher will naturally mention Charles Wesley’s winning the Golden Halo on Easter Day, this hymn is most appropriately sung immediately following the sermon. The fourth verse, while optional, requires organ, trumpet, and timpani if it is to be used within the context of the liturgy. In the final video of Lent Madness 2014 from the Archbishops, the Golden Halo winner is proclaimed and the kick-off date for Lent Madness 2015 is announced. Commemorate this great moment in church history by purchasing your very own Charles Wesley mug. It features Charles with the words “2014 Golden Halo Winner” and “Lent Madness.” This is the perfect gift for every Episcopalian and every Methodist. Or really anyone who likes good hymns. The Charles Wesley Golden Halo Winner Lent Madness 2014 mug is white ceramic, ready to hold 11 ounces of your favorite beverage. Pre-order yours now for just $11. Buy five or more for just $9 each. They’ll ship soon! Buy now! Maybe you want to get a more general Lent Madness mug. How about a purple ceramic mug that says “Who will win the Golden Halo?” on one side with the Lent Madness logo on the other? Eleven ounces of tea or coffee will be more delicious, thanks to the wondrous powers of purple. This makes a great gift for anyone who loves warm beverages, the color purple, or mostly cylindrical objects. Pre-order for just $11. Buy five or more for just $9 each. They’ll ship soon! Buy now! 131 Comments to "Congratulations to 2014 Golden Halo Winner — Charles Wesley!" 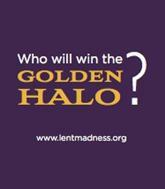 My heart is strangely warmed at the thought that a Methodist won the 2014 Lent Madness Golden Halo! Charles lived and died an Anglican, by his own words. in piety he was methodist, lower case, and by polity staunch Church of England, eschewing the cause of separatism from the CofE championed by his brother John. Lois, you are absolutely correct! But, what a gift/person for both sister churches. Now, let’s raised voices in song! John Wesley did not “champion the cause of separatism from the C of E”. He never left the church, lived and died a C of E clergy. He responded to the need of the American Methodists for the sacramental ministry of clergy by sending them some, and also sending a book of liturgy based on that used in the C of E. Most C of E clergy in America had returned to England before or during the Revolutionary War. Charles’ funeral was officiated by an Church of England priest. John’s funeral was officiated by Methodist preacher. John may have seen himself still among the faithful of the C of E, but his heart was Methodist at the end or he would have had a C of E service. Lois, I wouldn’t say that John championed the cause of separatism from the Church of England, for he too lived and died an Anglican. I think he simply didn’t foresee that his actions would lead to separation. what was the vote count? But of course he wasn’t a Methodist, but rather a staunch Anglican his whole life. The term “Methodist” was used derisively for the members of the Holy Club that John and Charles began at Oxford because members were methodical in their quest for holy living. To Lois and Betsy: Yes, Charles WAS a Methodist. Grace is correct. The Methodists were a reform movement, started as the “Holy Club” begun at Oxford, called a “Society” in the C of E. We first became a separate church in America. I don’t know exactly when they became a separate church in England. I am a lifelong Methodist. According to methodist.org.uk the Plan of Pacification adopted by the British Methodists in 1795 was “a decisive break with the Church of England”. Neither Wesley was a Methodist. I assume that was a joke. Worth noting that Basil the Great got more total votes in Round 1 than either of the Finalists did. But Christina is still astonishing to me! Me too. I thought it would be very Episcopalian to choose a mystic over a church scholar. Maybe next year Christina will get her due. Madeleine Baier did not put me up to this, but I have to ask: If Fred Rogers was on a Local Calendar of a parish church would that qualify him to be in the Bracket? Uh, no. And, of course, just because a particular saint is eligible doesn’t mean he/she will necessarily make it into the bracket. (just finished washing feet!). I think a local calendar is good enough for me to raise up Fred Rogers!!! Peace y’all. Babs. Well, who knows, Babs, you and Madeleine (and Fred Rogers) may yet have your day. Sigh – so very disappointing. I’m really surprised. Even though I voted for Charles, I thought Harriet was going to win. It was close, though. I so enjoyed this…thank you! A great choice, though I still love Harriet Bedell (Go ‘Noles) and thank you for sharing her story with us, along with all those of the other inspiring participants. And so today I will have the new version of one of my favorite hymns going through my head all day ( supplanting “The Rains of Castamere”). I just hope that the SEC will take a cue from DWTS and other challenges and give us an “All Star Lent Madness Also Rans” at some appropriate year! Hooray for Lent Madness! hooray for Tim & Scott! Hooray for the Celebrity Bloggers! Hooray for the Archbishops & the Clairvoyatron 2000! What a close race! and lots of fun along the way. Many thanks. WOO HOOOOOOO! ZIPPITY DOO DAH! Onward to Lent Madness 2015, and I am prepared, nay energized, to lift my Fred Rogers banner high for the bracket. I will sing this hymn with the more than usual enthusiasm this Easter. Oh John, quit your grumbling, can’t you at least TRY to be happy for your brother? Talk about sibling rivalry. …. Hooray for Charles! and Madeleine, I second your nomination of Fred Rogers. We’ve had a Catholic and proto-Methodist halo winner . . . why not a Presbyterian? Madeleine, check out my question to Fr. Tim (see above). You might be interested in his answer (although I sent it kinda late. He’s probably washing feet right about now). Vote was 3,607 to 3,407 Evelyn. You can click on the 2014 bracket and choose the link for the “challenge” 🙂 I also was strangely warmed by the choice of Charles as winner. He did much more than music. This has been such a wonderful Lenten experience, both fun and informative. Thank you SEC. I have been introduced to some new and very worthy saints. Having been raised in England by a Methodist mother and C of E father, I am extremely happy with the result. Many happy memories of being a little girl and singing my heart out in our village church with my dad and two sisters. Blessed Easter everyone. Thank you for Lent Madness — I think that of all the contestants (for lack of a better word) there was only one person who made me pause and think, “Why was he included?” Thanks again! Charles Wesley preached at Old North Church. We are so thrilled to beat our cross town rival, Phillips Brooks of Trinity, Copley Square. Harriet was truly worthy. maybe runner ups could get a high seed the following year. A win for little brothers everywhere! Thanks for all the fun. Congrats to Charles! As a United Methodist pastor and a former Nazarene, this is well and good. Indeed, he was much more than a hymn writer. But, as a Floridian with a daughter at FSU and a daughter-in-law who is an Episcopal Priest in South Dakota who works with Native Americans, I would have been very pleased to see Harriett take the halo as well. Might I suggest the mother of the 19 Wesley siblings be nominated next year?! Susanna Wesley for golden halo! Portia is following in Harriet’s footsteps in South Dakota! Just ordered 6 mugs as gifts for my family and friends in the Methodist Church in the hopes of encouraging their participation next year! Thank you for this Lenten discipline. There’s a Methodist to our Madness. hysterical – made me LOL! This is he only bracket race I have ever won, but it was a hard choice with Harriet. I wanted to vote for her too. Thank you all for making this a fun time during Lent. This is my first year doing this and I look forward to next year. Thank you SEC and Celebrity Bloggers for shepherding us through our Lenten journey once again. 3,607 votes + 3,407 votes = 7,012 voters? There did the other two votes come from? This is my second year of following Lent Madness and it has been as enjoyable as 2013 was. Being a Methodist, I have been enlightened with the bios of so many saints I had not known. I am delighted that Charles Wesley won, his hymns have made many worship services so much more meaningful. I’ll see you all next year. A ‘methodical’ man of God wins. Though, Harriet was and is a Saint of God. Can you get Methodist Review to show Lent Madness some love? A few weeks ago you posted a link for us to follow after Easter. Can’t locate it and want to post to my church’s FB page. Can you send me in the right direction? These past 40 days have been so great – don’t want to stop. Adios. Au revoir. Arrivederci. This has been great fun and I am looking forward to next year! I agree. Disappointed but there is always next year! I’m sure Bach would be pleased. It is an ecumenical victory this year, and being in full communion with the UMC (http://www.elca.org/Faith/Ecumenical-and-Inter-Religious-Relations/Full-Communion ), I rejoice with them and all those who supported Charles Wesley. Thanks to the almighty SEC for a great year, as well as to their many humble servants, and of course, you, the Lent Madness global viewing public. This has been terrifically fun and informative. Thanks to the Supreme Ones, all the Divine Bloggers, and our very own Connecticut Bracket Czar for a wonderful experience once again. Then let us sing, for whom he won the fight . . .
Charles, I sincerely hope you are humming a celebratory tune in praise of your Lord and in thanksgiving for your life’s work! Harriet, you have inspired us all to serve more fully and to love more. Thank you, thank you. Loved Lent Madness and would like to spread the word. However, I’m not a coffee drinker. Has the SEC considered marketing Lent Madness t-shirts also? I would dearly love a purple T-shirt with “who will win the Golden Halo?” on the front and the LM logo on the back, and I’m sure I’m not the only one who would purchase this! Ooo…good thought. Though in my experience adult beverages can be consumed out of any container, mugs included! And you’re right about Episcopalians, the denomination where the church kitchen probably has one can opener and four corkscrews. Though on Saturday night after the Great Vigil we will break our fast with chocolate and champagne, no corkscrew required! Thanks be to God for Charles and all musicians! Thank you Scott, Tim, Maple, CBs, and all FM & LM behind-the-scenes support staff. Tessa, that’s a great idea!!!! at one church I was at we broke fast after vigil with cakes and cold duck! I like champagne better though. Can’t say I was strangely warmed about Charles, but I will be even more aware of his hymns while singing them, and I do congratulate him! I am very warmed by the fun of this year’s Lent Madness and the efforts of so many to find new ways to teach spiritual practices and church history through the LM bracket! Thanks ever so much to Tim and Scott, bloggers and researchers, production staff, and participants, and for modeling a wholesome way to “blog” and comment. Happy for Charles, but I do love Harriett. When can we make nominations for 2015? I’ve got a great one. I have really enjoyed my first Lent Madness. Such wonderful people to learn about and so many good things to take from each. Charles Wesley was a super winner! He would probably write a hymn about all of God’s people. Thanks for the experience. I thought this year would be Bach in a walk. But I learned to admire all comers–even those beknighted Egyptians–and by the time the Faithful Four set to, I was cheering for each one. Harriet is grinning at Charles now as they toast with Lent Madness mugs and wonder who among the cloud of witnesses will enter next year’s bracket. Thanks, SEC, bloggers, voters, and posters. What a joy to share in this community of light, laughter, and love. I suspect a Methodist to this madness. This really should be a quote on the back of the Golden Halo mug! Lent Madness, for the second year in a row, has both entertained and inspired me! Thanks to everyone who has participated. May God give you all a blessed Triduum, Easter Day, and Eastertide. Love and peace from your United Methodist sister. Yes, heartfelt thanks to all and sundry who made this LM fun and informative! You all ROCK!!! It’s been a fantastic romp through the bracket this year. Thank you to all who work so hard to make it such a wonderful experience! Hooray for Charles! The music will soar even more joyously in our churches Sunday, as he inspires us to celebrate Resurrection with “Christ The Lord/Jesus Christ is risen today”. Gettin’ the purple mug and imprinting Harriet’s photo on it ! She won as far as I’m concerned because she still has the impetus to help us all be more and better than we are ! …..and AMEN for real !!!!! The countdown clock at the top of the page tells us Lent Madness 2014 begins in 308 days. That’s pretty startling when you see it early in the morning and think you will have to repeat the exact contest next March. I vote for Lent Madness 2015 beginning then instead. Thank you so much! I too would like a t shirt. Thank you Lent Madness and the Supreme Executive Council for this rough and tumble season. I learned a lot and am very happy with the winner (although all the saints would have made me happy, since they are all worthy). It should not surprise us that Deaconess Bedell has taken second place in this poll. After all, the first clause in her rule of life is “God is first”. And so Lent Madness Withdrawal begins. Surely the only cure is one more chocolate crème egg. Thanks to the Supreme Executive Council and their Holinesses Cranmer and Chrysostom for a great run. I am rejoicing that Charles Wesley won — especially since Bach lost (I still think there should have been a recount!). My joy is mixed with a little bit of sadness that anyone (and it has now happened twice against Charles) thought they could engage in voter fraud/cheating to beat Charles Wesley! What did people think, that Spy Wednesday was a day to celebrate Judas for his betrayal of Jesus? This is simply the sin of arrogance — arrogance that says that the perpetrator knows better than anyone else who should win! Scripture labels arrogance as the worst of sins. Unfortunately, it goes back to original sin — Adam and Eve thought they knew better than the Lord God Himself about eating the forbidden fruit from the tree of knowledge! However, I am ever so glad that good once again triumphed over evil to save the day! Congratulations to Charles Wesley! It was mostly fun! It was awesome to be apart of Lenten Madness. It is a great way to learn of all those that went before. How they worked to spread the Kingdom of God is so varied. It shows us, me, how in so many different ways God can be glorified. We such need to be open to what God wants us to do. We are Blessed to have a living God to call upon and trust and hope in for guidance. Well said, a good summary. Congratulations, Charles! And THANKS so much Scott & Tim & CBs for the knowledge (new-to-me wonderful saints & vocab! ), humor, fun & entertainment this Lent–a blessed Triduum to all! It can’t be over already! Just the other day we were trying to decide between Basil the Great and Christina the Astonishing. I’ve met some really interesting–and downright strange–folks here (I’m speaking, of course, of the contestants!) and have gotten to know Celebrity Bloggers, frequent commentators, and of course the Supreme Executive Council. Many, many thanks, Tim and Scott, for another great year. May you have a blessed Triduum and a restful Easter Monday. A big thanks to the SEC and to all the Celebrity Bloggers! Another terrific Lent Madness is complete and what a ride this one was. I will now try to create 2 little crochet figures of Charles Wesley for each SEC for their personal Hall of Fame of Golden Halo winners. It might help me cope with LM withdrawal. I had to laugh at myself: When I saw the subject in my e-mail I tossed my hands in the air yelling (well, quietly as I’m a librarian) “Yes!” It was a hard choice at the end and I think I would have been satisfied if Harriet had taken the halo. It was a great season, I learned a lot and met some wonderful saints. Shouldn’t the countdown clock say 2015? 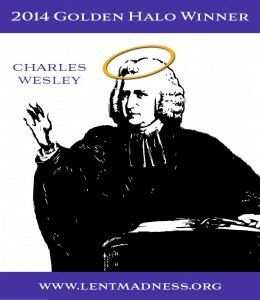 Well, congratulations to Charles Wesley on winning the Golden Halo. I hope this reassures all those who worried that Bach’s earlier defeat meant Episcopal Churches would be overrun with big screens and follow-the-bouncing ball music. We love our hymnody. We love our liturgy. And Lent Madness is da bomb. Thanks! I look forward to more madness next year. Thank you for a fabulous Lent once again. I have learned so much. Would have been delighted with either of the final two winning but surprised myself by voting for the winner for once. I will sing his seasonal hymns with purple tinted glasses and a happy smile. Oh what fun we have had. Cant wait to get my mug. Thank you for Lent Madness. Well my first Lent Madness is under my belt & I have read all the posts with much interest and admiration for beating me to the punch on almost everything I had wanted to say! Other than…I have appointed myself as the Lent Madness 2015 Commissioner for my home parish of St. Christopher’s Fort Worth and the campaign has begun in earnest!! Congratulations to my dear Br. Larry Hicks and all the great Methodists at Big Clifty, McDaniels, and Alexandria Chapel UMC churches in Kentucky. Go circuit riders! His heavenly anthems sing with texts that are his own. We sings his praises to the sky, his words the truth have sown. For my LM friends, a link to my Easter blog post…. This was my 1st Lent Madness. Thanks for a stimulating Lent, especially to CB Robert Hendrickson who brought Lent Madness to the Wilderness in Denver. Encountering new saints was specially rewarding since it introduced me to Harriet Bedell, among others. Her story recalled to me the memory of a dear friend, George Harris, whose ministry took him to the Philippines, Mobridge, SD, and finally to Alaska, where he served as bishop. I was voting for Harriet all the way, but will be singing “Jesus Christ (or is it Charles Wesley) is risen today” with special gusto this Easter. Looking forward to next year! Thank you for a wonderful Lent—Congratulations to Charles! I think your song words are a bit sacraligeous, especially for a man of the caliber of Charles Wesley who was a humble reformer of the church – I will, however accept them in the spirit with which you penned them. It is our Lord Jesus Christ who is risen and Charles Wesley would be mortified at your tribute! 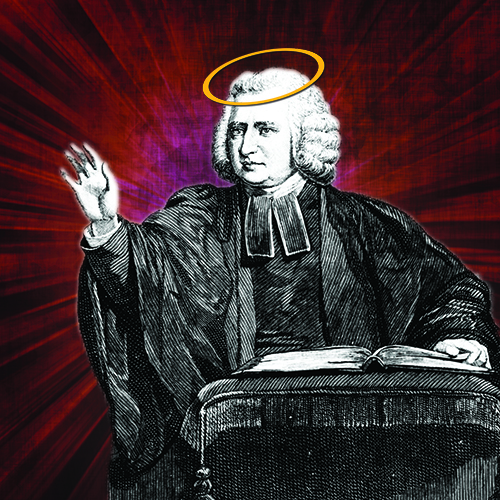 I am thrilled that Charles Wesley was voted for the ‘Golden Halo’. I grew up on his hymns and am still moved by them to this day! Kudos to all of the writers and researchers. It’s Good Friday and Lent Madness is over. Is it still possible to post a comment? Is anybody out there? HELLO! HELLO….Hello….hello…. If you can still hear me, thanks to the Supreme Executive Committee, the Celebrity Bloggers, the Bracket Czar, Maple Anglican, the Commentators, and the Voters for yet another wonderful Lent Madness. And thanks be to God and all the saints. Hahaha! Great Lent. HOLY TIME NOW. God bless all. The Great vigil is upon us. Only FIVE more services to go! We need a count at the end of how many times you’ve enjoyed a Charles Wesley hymn during this cycle! Good idea! I will do that. Please consider the modern Servant of Peace, Dag Hammarskjold, for 2015.